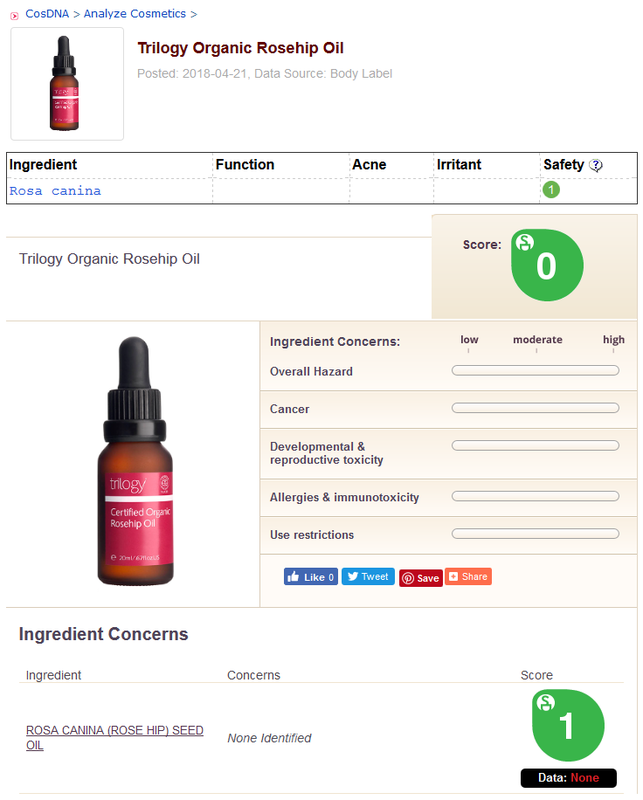 The Trilogy Rosehip Oil is 100% organic and claims to contain a minimum of 80% essential fatty acid (Omega 3 and Omega 6) and non-essenial Omega 9, to deliver all-over nourishment and repair for optimum skin health. It is said to be highly effective for reducing scars and stretch marks and other skin concerns including dehydrated and ageing skin. 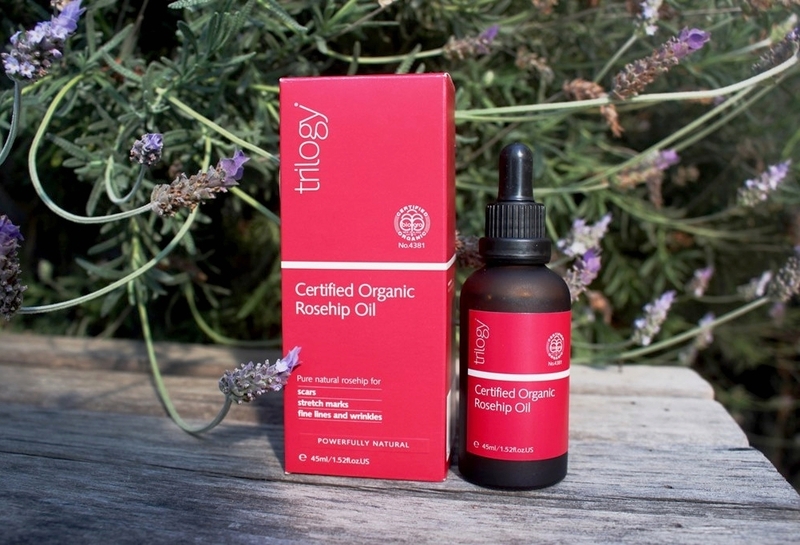 Trilogy Rosehip Oil is certified organic and sourced from seeds of wild rosehips found in the mountainous regions of Chile in South America and Lesotho in southern Africa where growing conditions are ideal. The rosehips are hand harvested by surrounding village communities assuring a sustainable and low impact production process as well as assisting to grow the local economy. 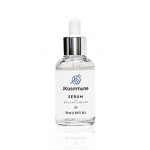 Being organic, the oil comes from rosehips that are grown without interference from pesticides and other chemicals. 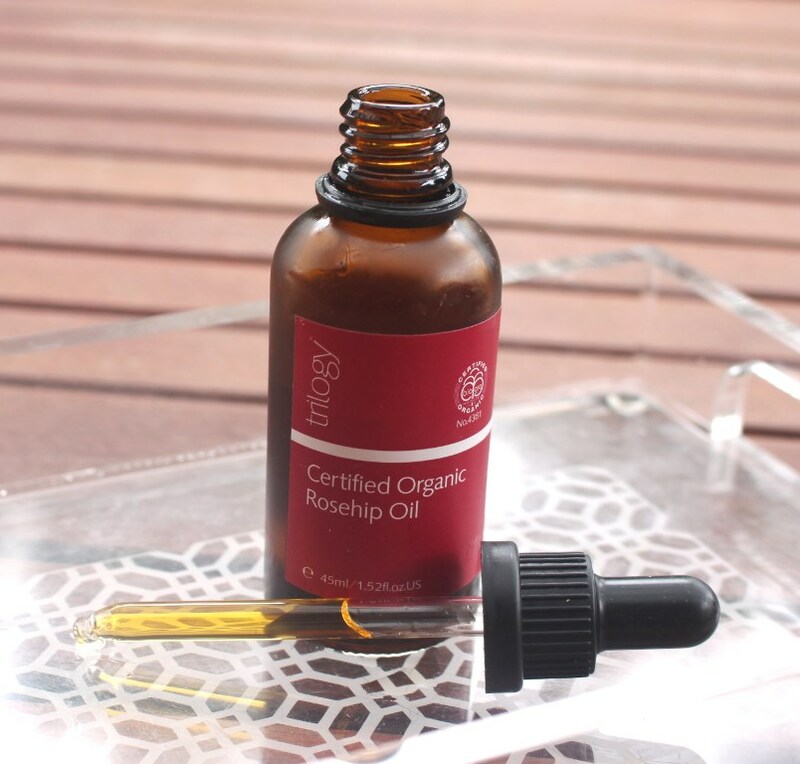 A high quality rosehip oil such as this, undergoes cold-pressed extraction to maximise its effectiveness. This can be visually confirmed by the deep golden colour. 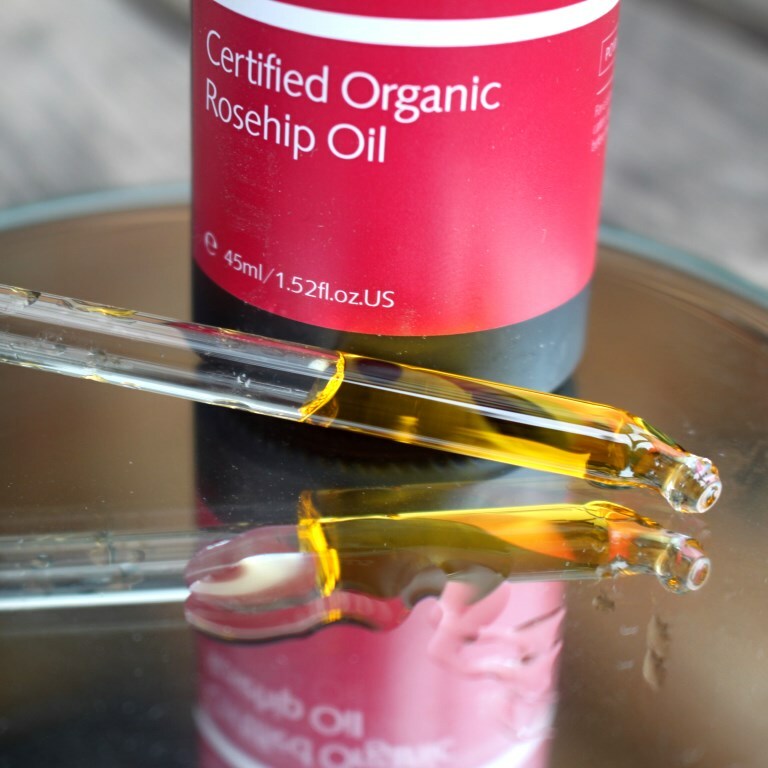 The key benefits of rosehip seed oil are a direct result of its high concentration of fatty acids. This product is guaranteed to contain a minimum of 80% omega 3, 6 (both essential) and 9 content as well as beta-carotene (pro-Vitamin A). Fatty acids are lipids that are vital for maintaining a healthy skin barrier. 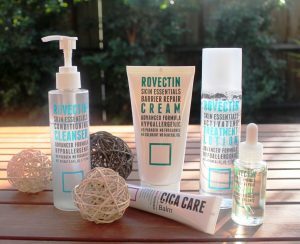 They assist to moisturise, improve softness and elasticity as well as accelerate the repair rate of skin suffering sun damage or oxidative stress. 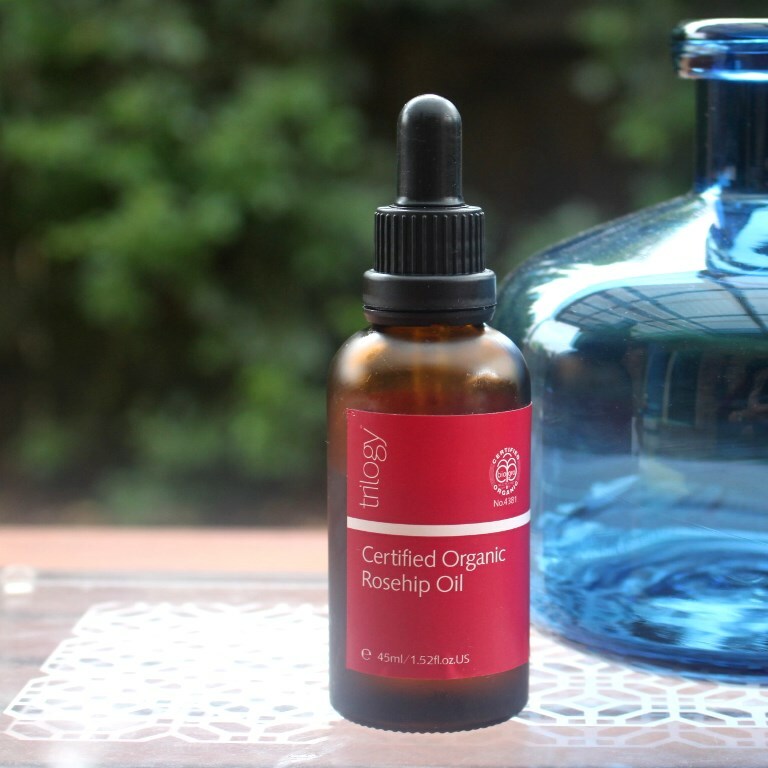 Rosehip seed oil is great for ageing and dry skin but can benefit all types. Due to its structure resembling that of our own sebum, it is highly compatible with our skin. 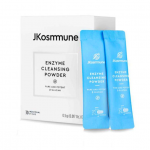 The outcome of this is it absorbs quickly without clogging pores and helps to balance oil production hence also making it suitable to those with oily and acne prone skin. The combination of Vitamins A, C and E help decrease inflammation (redness), reduce sun damage (brown spots) and help scar tissue to regenerate in a smoother and more normal fashion…. 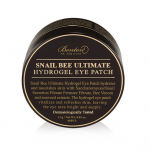 It also helps stimulate collagen production and increase cell turnover rate (anti-aging). The essential fatty acids are emollients (hydration). 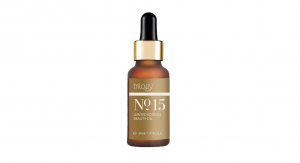 The Trilogy Rosehip Oil comes in a dark, near opaque glass bottle with screw top dropper dispenser. The pipette has a curve at the opening to reduce dripping. It doesn’t get much simpler than a one ingredient product, 100% organically derived, cold-pressed for maximum potency. A big tick of approval. The oil gives off a natural, one part woody, one part fish oil scent, partly due to its high omega fatty acid content. 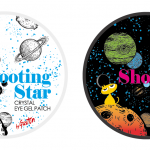 Trilogy have released this product in two sizes. 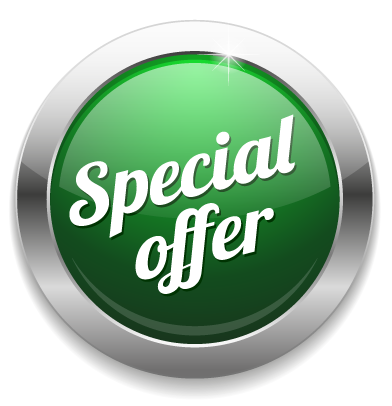 The 20ml bottle sells for AUD$25.95 while the 45ml bottle has a recommended retail price of AUD$42.95. 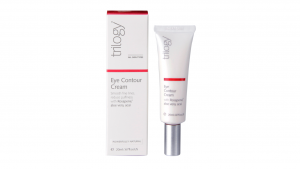 Trilogy products are easily accessible both in store and online. 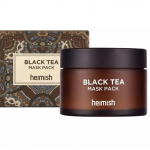 They are available at department stores and pharmacies as well as being sold by many online beauty houses including the brand’s own website. 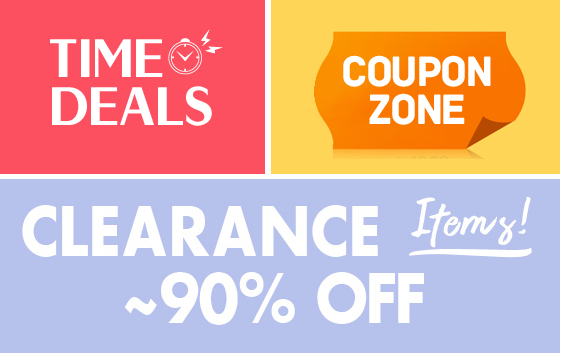 Buying direct also offers customer loyalty rewards. The oil lasts 6 months after opening. 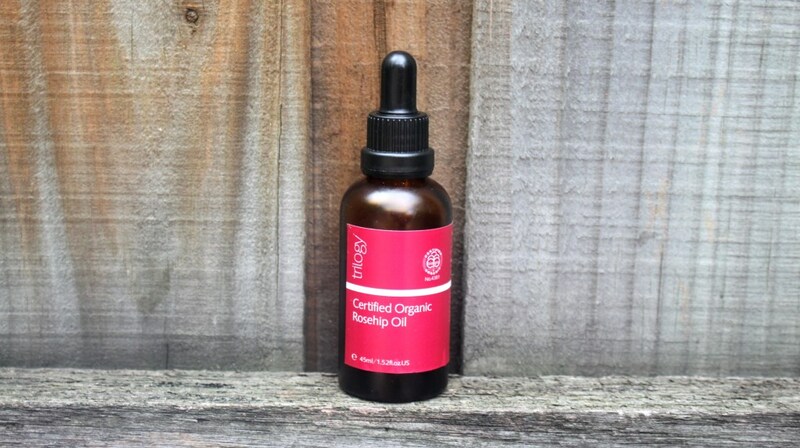 The Trilogy Rosehip Oil is presented in a semi-opaque brown bottle to prevent unnecessary exposure to the light. I store it in a drawer when not in use to help the cause so it doesn’t go rancid. The dropper dispenser is effective, the curved end helping to stop dripping. The oil is a rich yellow colour which promotes a feeling of luxury when used. 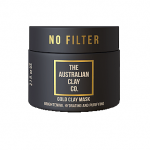 It has excellent spreadability so only a few drops are needed per application to cover face and neck. As I really enjoy this oil, I am a little heavy handed and apply around 4-5. 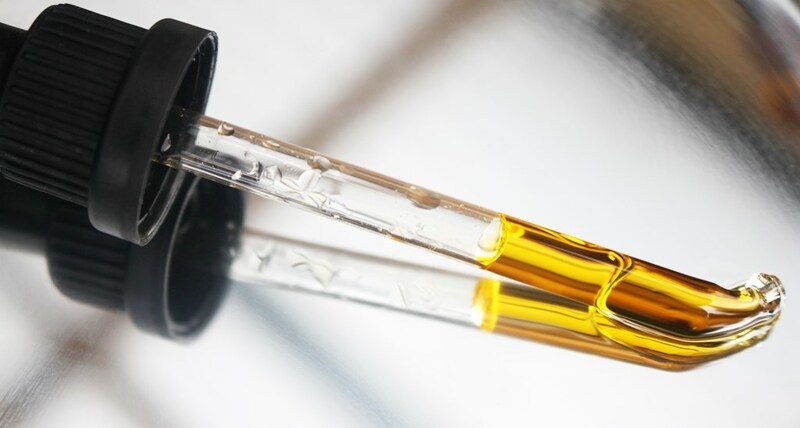 The oil has a slight scent to it which is totally natural. High omega fatty acid content triggers a slight fish-like smell. Once absorbed it’s not noticeable. 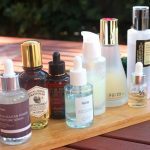 As it is a dry oil lacking heaviness, it only takes a few minutes to fully sink in but should be used in conjunction with and not as an alternative to a moisturiser. I tend to apply both in combination so they can be massaged into the skin together. 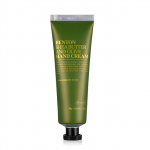 Skin gets an instant boost of moisture and with continued use, it feels softer and retains a healthy glow. Due to the high fatty acid content, results are comparable to the Paula’s Choice Resist Omega+ Serum which I also love. This allows me to try other serums and still get the barrier strengthening through an oil instead. 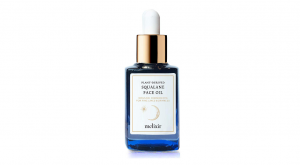 Like the serum, this oil really nourishes the skin and puts it in a position to fight off ageing and dryness. 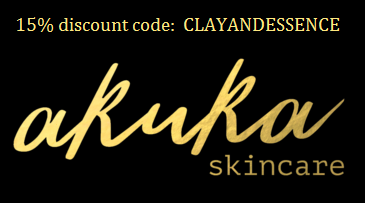 My skin looks better and feels stronger when I use this product. As such, it is an ideal choice for mature skin. 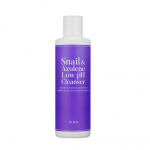 Fatty acids also help to balance sebum and control oil production. I have noticed that my T-zone is still matte at the end of the day and that my dry jawline is softer resulting in a more balanced complexion. 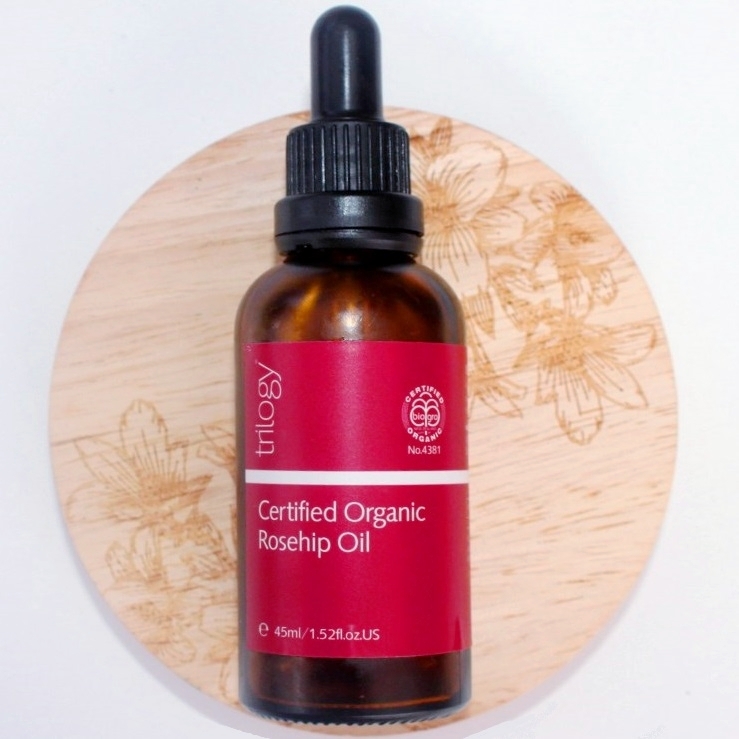 So rosehip oil is also a great choice for those with oily skin looking to control their natural excess oil production. 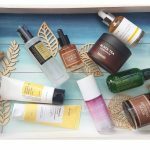 I guess there’s a reason why it is referred to as nature’s retin A since it delivers similar anti-ageing and anti-acne benefits.